Accurate Measurements of Boiler Tube Surface Temperatures. Designed to perform in the Boiler Environment. Fast speed of response: Measuring junction underneath pad. Uniform Sheath Diameter over entire length. Rugged MgO insulated sheath. Fully annealed for ease of bending. Factory Pre-Formed pads. High Temperature moisture seal. Flexible Leads with strain relief. Tag # stamped on pad & SS tag. 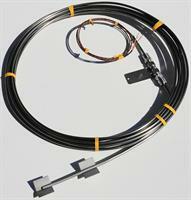 No reviews were found for Model Style 1050 - Boiler Tube Thermocouples. Be the first to review!